Ideal transitional gait training contracture AFO to reverse mild contracture of the ankle / foot (< 15° of plantarflexion; < 10° inversion). 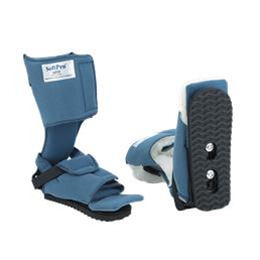 The semi-rigid AFO insert will “flex” into the plantarflexion contracture to assist in reversing mild ankle contractures. The permanently attached ambulating pad allows the patient to bear weight and walk in the AFO. Orthotic therapy for mild plantarflexion contracture, or mild abnormal tone and spasticity of the ankle and foot. Permanently attached ambulating pad allows the patient to bear weight and walk in the AFO. The AFO is made of a flexible material, and will provide a gentle dorsi-flexion stretch of the ankle / foot. Plantarflexion reversal is achieved by the gentle “dorsi - flex” of the plastic insert combined by weight bearing and transitional walking in the AFO. The heel “floats” pressure free in the AFO. A hip rotation bar can be used to control external / internal rotation of the hip. The SoftPro™ Ambulating AFO is a transitional AFO designed to treat mild lost range of motion of the ankle / foot and to facilitate assisted weight bearing and initial gait training. This device is a transitional AFO and not intended for patients who are active ambulators. Small Fleece SP 20-00 6" - 8" 15"
Medium Fleece SP 20-0 18" - 10" 17"
Large Fleece SP 20-0 10" -11" 19"
Xlarge Fleece SP 20-03 11" - 12" 23"
Small Smooth SP 20-50 6" - 8" 15"
Medium Smooth SP 20-51 8" - 10" 17"
Large Smooth SP 20-52 10" -11" 19"
Xarge Smooth SP 20-53 11" - 12" 23"